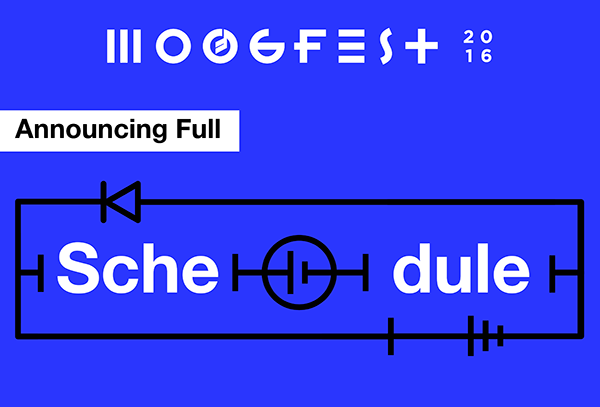 Durham, North Carolina (April 12, 2016) – Moogfest 2016 today unveiled the full schedule for the expansive four-day festival. Exploring the future of technology, art, and music, the festival includes more than 300 musical performances, daytime workshops, conversations, masterclasses, film screenings, live scores, durational sound installations, and multiple interactive art experiences. 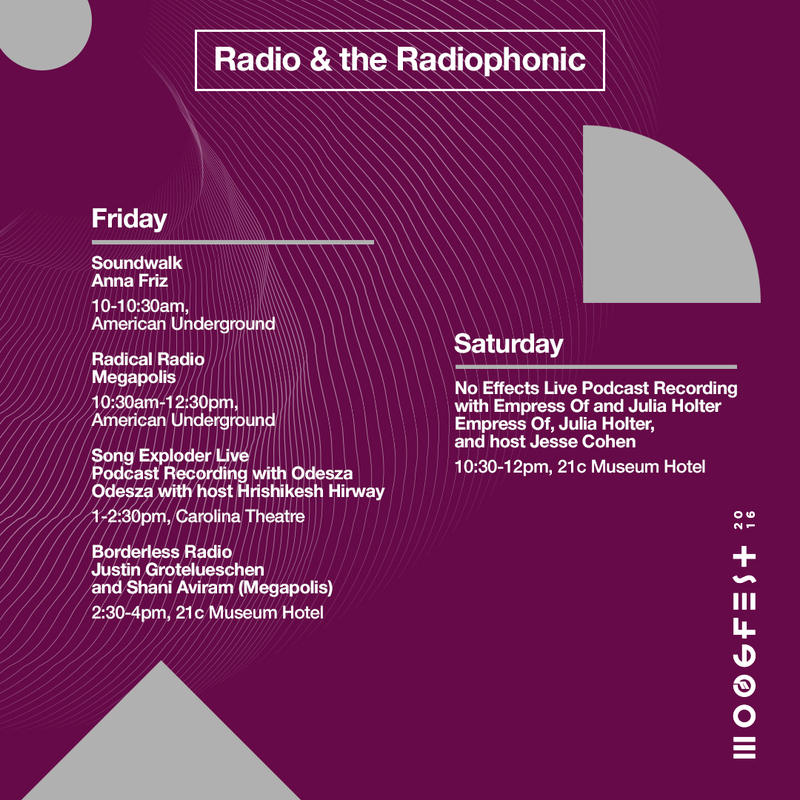 The full schedule can be found online at: https://moogfest.sched.org/. *Please note, the full schedule can be viewed on Sched, however, registration and adding sessions to your personal schedule won't be available until sign up opens in the coming weeks. Moogfest celebrates the legacy of Bob Moog, a visionary engineer who pioneered the analog synthesizer and other technology tools used by artists like Stevie Wonder, David Bowie, and Kraftwerk. 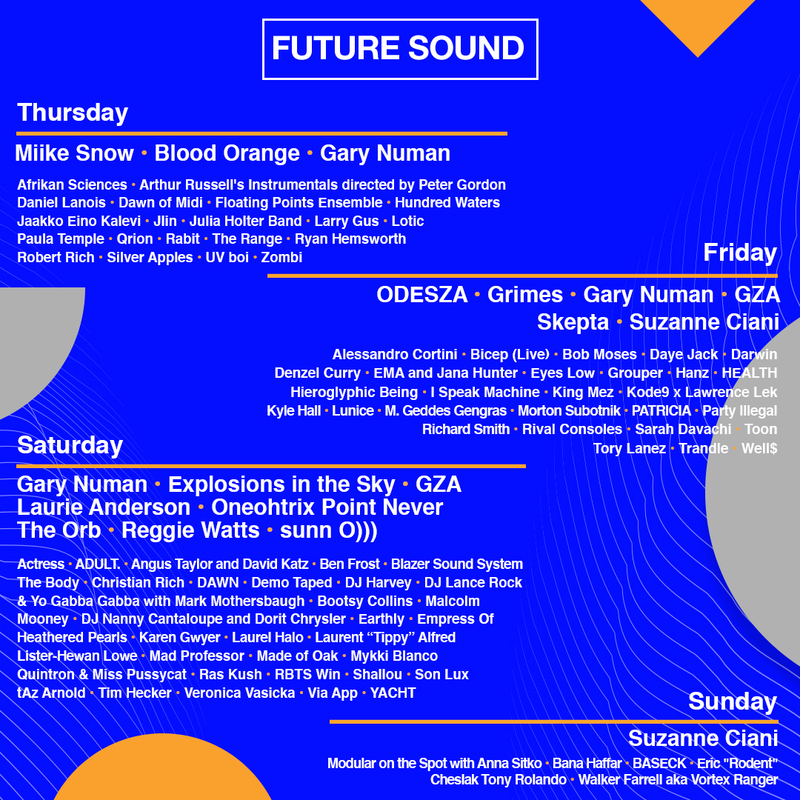 This year’s program will feature over 250 innovators in music, art, and technology -- from Gary Numan (3 nights), GZA (2 nights), Grimes and Laurie Anderson, to virtual reality pioneer Jaron Lanier and transhumanist visionary Dr. Martine Rothblatt. 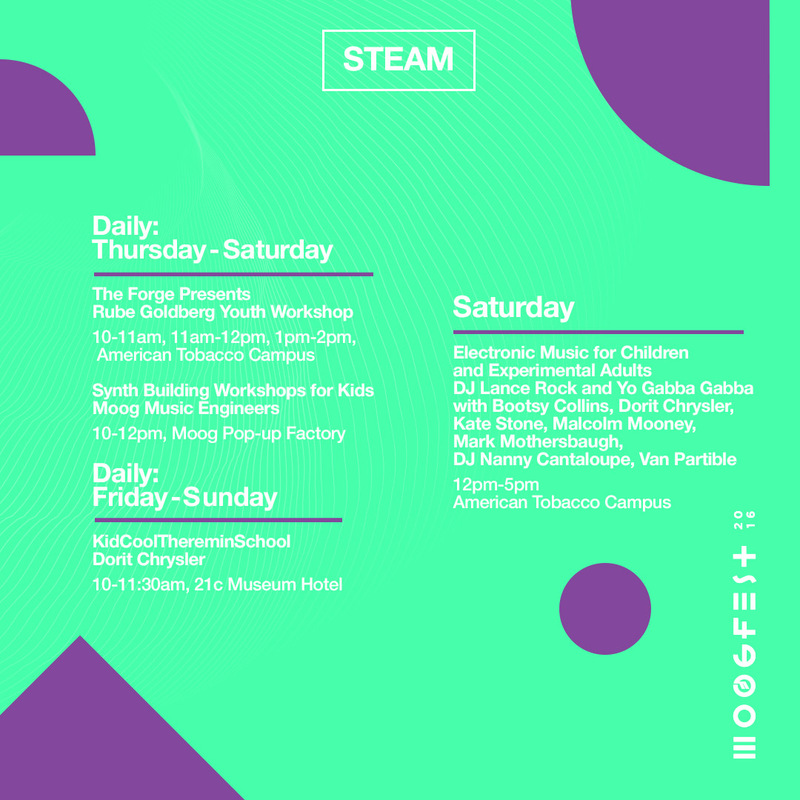 For the first time, Moogfest takes place in Durham, North Carolina, a fast-growing capital of technology, culture and entrepreneurship. From Thursday, May 19 - Sunday, May 22, Moogfest unfolds in venues throughout downtown Durham in spaces that range from intimate galleries to grand theaters. Special care has been taken to pair nighttime performances with spaces that have unique acoustics and style. Art Installations are site-specific and scattered throughout the city. The historic Carolina Theatre will showcase architects of sound and many avant-garde artists whose production is as radical as their compositions, including sunn O))), Explosions in the Sky, Oneohtrix Point Never, Laurie Anderson (special matinee show), Alessandro Cortini, Daniel Lanois, Tim Hecker, Arthur Russell Instrumentals, Rival Consoles, and Dawn of Midi. Transhumanist thought-leader Dr. Martine Rothblatt and virtual reality pioneer Jaron Lanier will both deliver daytime keynotes on ‘The Future of Creativity’ in the theater’s largest space, Fletcher Hall. Other tone-setting conversations include Laurie Anderson interviewed by Jana Hunter of Lower Dens; ‘Future Cities’, a Research Triangle Park-hosted town hall style conversation exploring the tomorrowlands that are being built today; ‘Time Traveling with Hip Hop’, a conversation between GZA and Duke Professor Mark Anthony Neal; ‘The Future of our Species’ panel discussion hosted by cyborg artist and activist Neil Harbisson; and ‘Hidden Figures: Women and Afrofuturism’ co-presented by Chuck Lightning of Wondaland with guests including Janelle Monae and Rachel Kaadzi Ghansah. 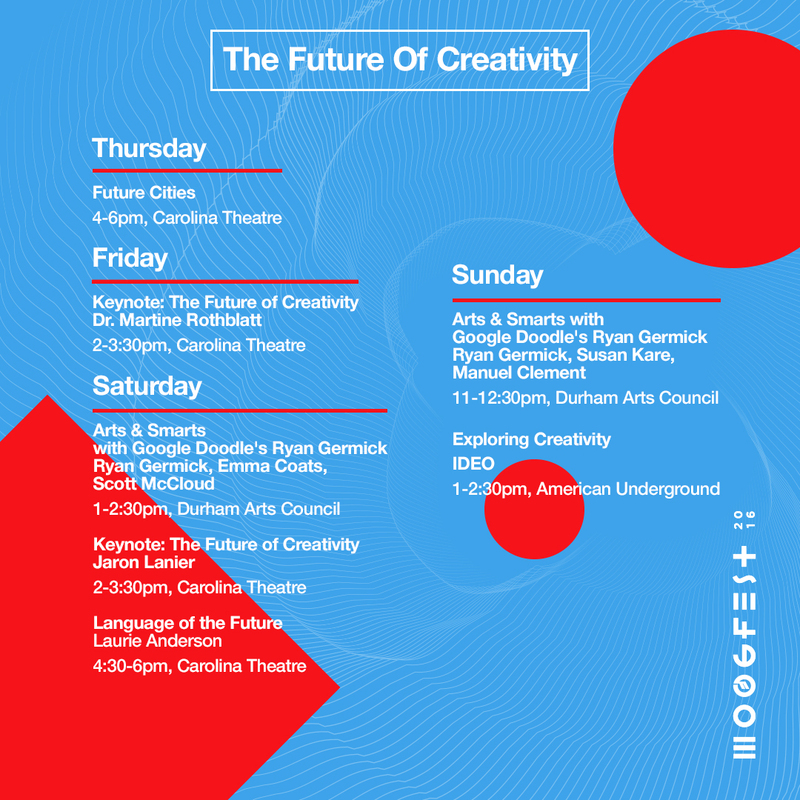 The Moogfest film program will also be presented at the Carolina Theatre including an experimental shorts program, live film scores and conversations with artists and composers working in film. 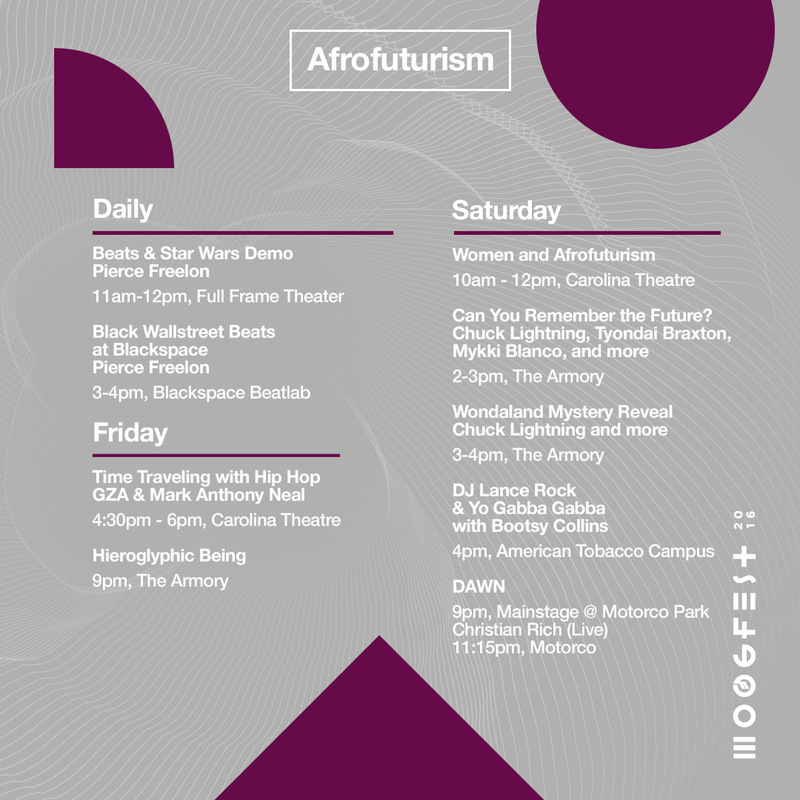 By day, this expansive venue hosts Moogfest’s masterclasses including Ben Frost & Tim Hecker, Daniel Lanois & The Orb, and a Daniel Lanois solo in-the-round performance, as well as conversations on ‘Reggae Soundsystem and Dub Production’ and Chuck Lightning’s Afrofuturism program, ‘Can You Remember the Future’? Moogfest’s largest venue, Motorco Park, is a mix of future-forward electro-pop and R&B with performances by ODESZA, Blood Orange, critically- acclaimed emerging artist DAWN (Dawn Richard) playing her first NC show, and the kick off of Miike Snow’s US Tour. The club that has quickly become a local institution features intimate performances from Gary Numan, Silver Apples, Mykki Blanco and newly announced The Range as well as a deep and distinguished hip hop lineup that includes GZA, Skepta, Torey Lanez, Daye Jack, Denzel Curry, Lunice and local artists King Mez, Professor Toon and Well$. The gallery floor of 21c Museum Hotel is a central hub for workshops. 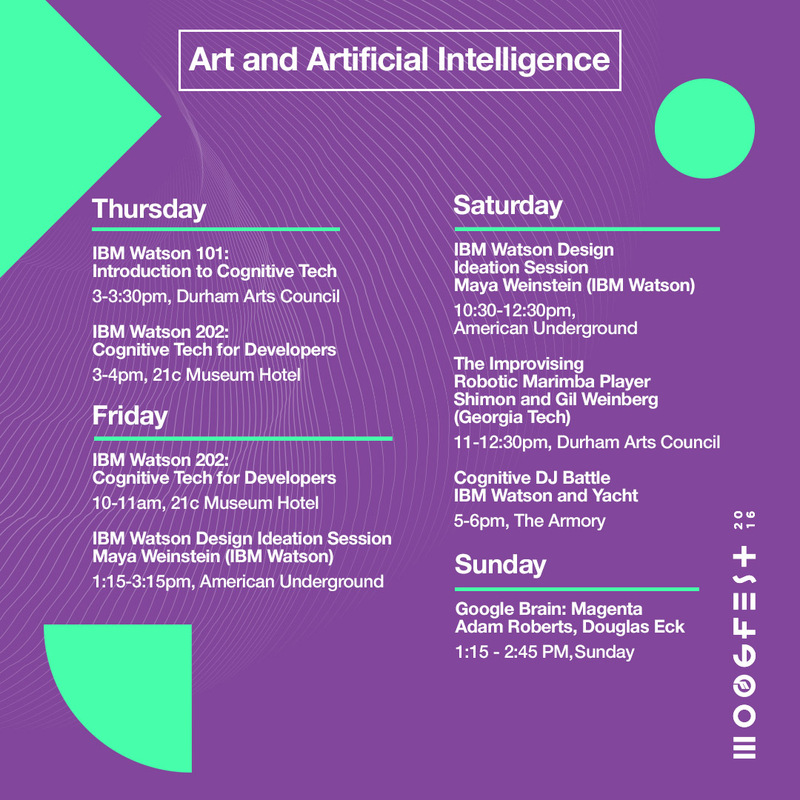 Blurring the lines between audio-visual installation and immersive experience, Moogfest 2016’s interactive workshops include North American Legends’ Unholy Matrimony and Church of Space’s self-hypnotism ‘Hypnotique Scéance’, plus youth theremin curriculum KidSchoolThereminSchool, generative music device Patter with Adam Florin, IBM Watson’s ‘Cognitive Tech for Developers’ and sonifying plants with Data Garden. Office Hours give festival attendees the opportunity to have one-on-one conversations with program presenters and participants. 21c’s main ballroom is home to the daily durational performance series (long-form musical artworks) that include Greg Fox, EMA and Jana Hunter, Richard Devine, and Suzanne Ciani, all co-presented by visual collective Undervolt & Co, along with a remarkable 8-hour Robert Rich sleep concert presented by 21c. The Durham Arts Council’s immaculately appointed black box PSI Theatre hosts innovative talks that combine performance and presentation, exhibiting music and visuals alongside conversation. Especially explorative sessions and performances include Onyx Ashanti’s ‘Musical Brains’, Georgia Tech’s musical improvising robot Shimon, ‘Arts & Smarts’ with Google Doodle’s Ryan Germick, Michael Garfield’s ‘Technoshamanism: A Very Psychedelic Century’, and Ben Knapp of Virginia Tech ICAT on virtual reality. 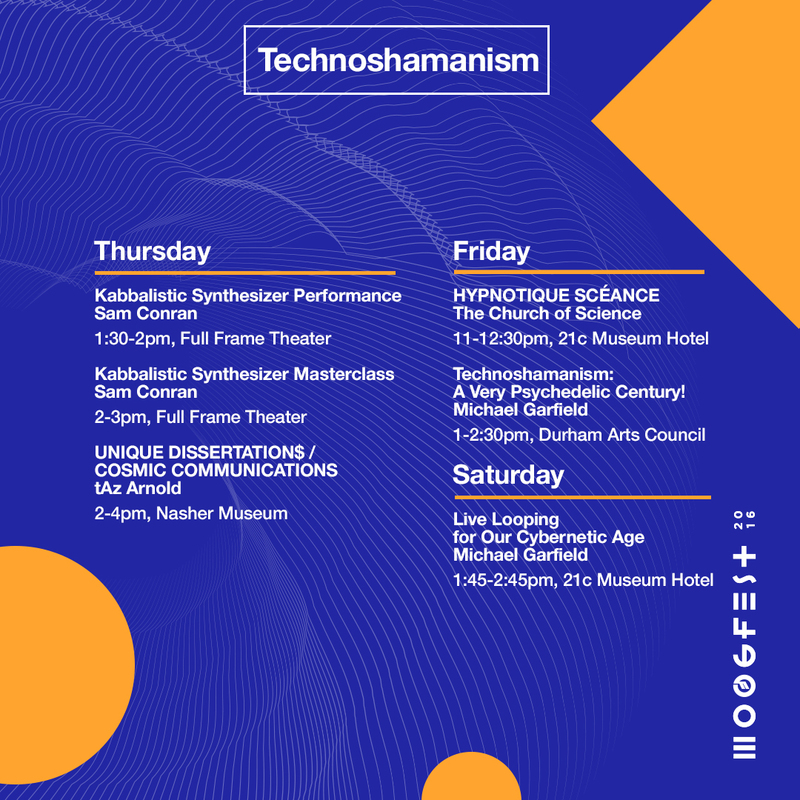 Daytime performances at PSI Theater include human cyborg Neil Harbisson’s synaesthetic pedicure, Moon Ribas’ seismic performance, plus a very special concert in celebration of synthesizer design pioneer Don Buchla, with Alessandro Cortini, Morton Subotnik, Sarah Davachi and Suzanne Ciani. A classroom style workshop space features 3-hour coding sessions with Undervolt & Co, Gray Area, EyeO, NEW INC series with Volvox Labs, Gabe & Dave, Luisa Pereira, and hands-on sequencer or synthesizer building workshops with littleBits and Dr. Blankenstein. Duke I&E hosts NC-local / Durham future-forward conversations including Exit Event’s ‘Founding The Future of’ and ‘The Future of Music Labels’ with RIAA and A2IM. Home to a large percentage of Durham’s startup community, this location serves as a hub for pioneering conversations and panel discussion from presenters including Kickstarter, NEW INC, Megapolis Audio Festival, Gray Area’s creative code meetup, and IBM Watson’s ‘Design Ideation Sessions’. 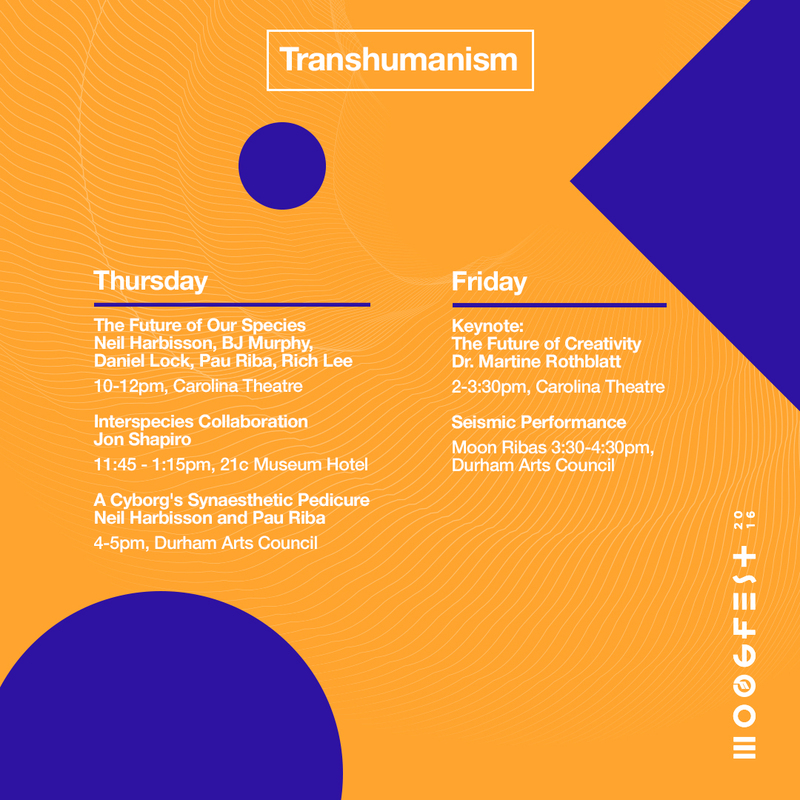 The Durham Hotel plays host to daily morning yoga set to Moog music on its open rooftop, and a Sunday Moogfest Disco Brunch with a four-hour long DJ set from Hieroglyphic Being. 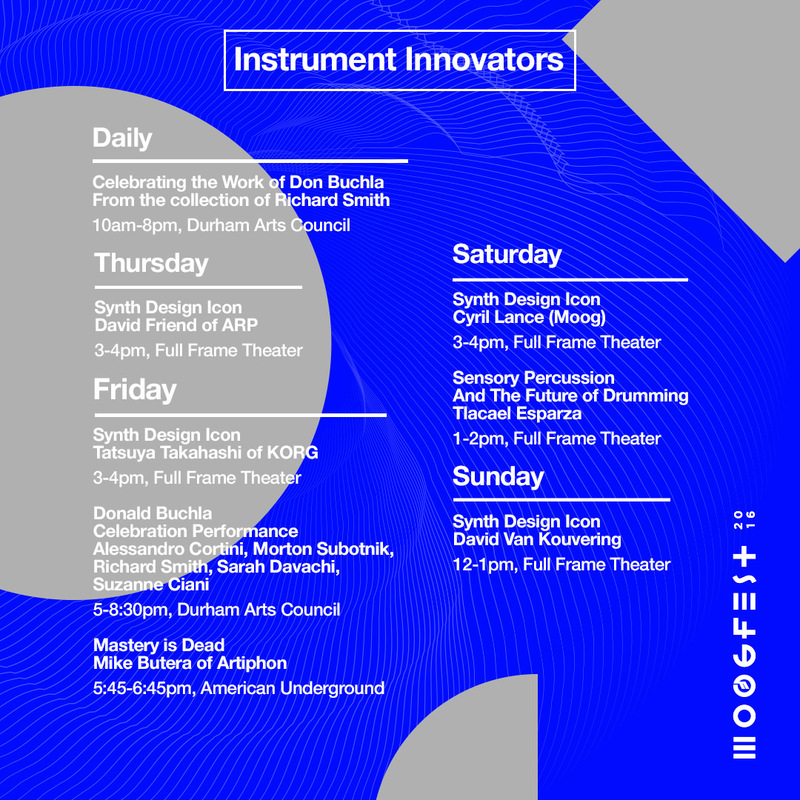 Situated within Moogfest’s Modular Marketplace, Full Frame is home to music and technology-based programming like the daily ‘Synth Design Icon’ series with presentations by Cyril Lance (Moog), David Friend (ARP), Tatsuya Takahashi (KORG), David Van Koevering (the Van Koevering piano). 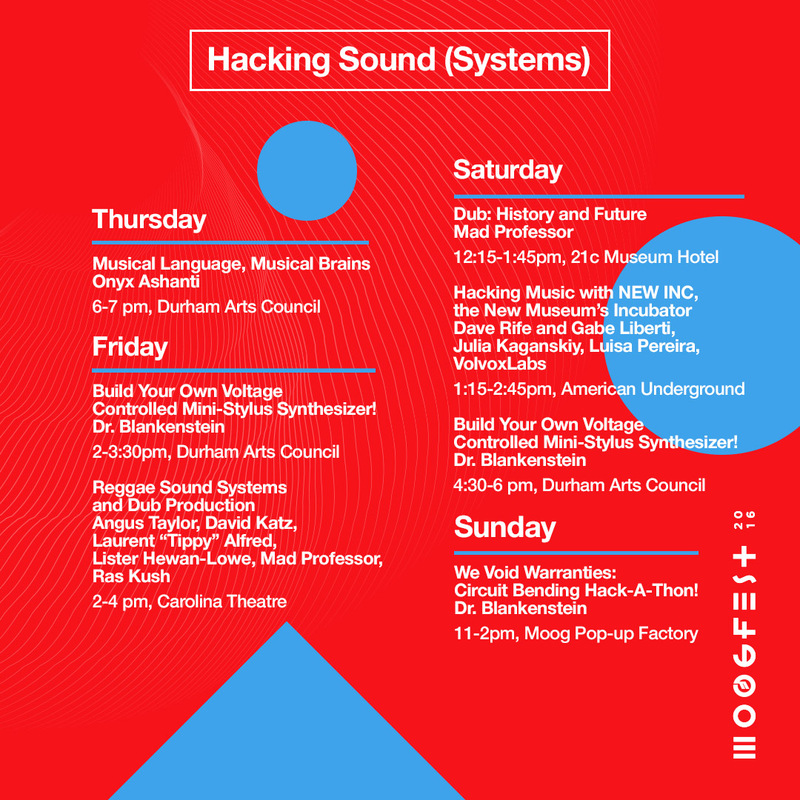 Performance-based programming from artists such as Sam Conran’s kabbalistic synth, Pierce Freelon’s youth beat demo, Ian Chang of Son Lux with Sunhouse, as well as demos and demonstrations from eurorack synth manufacturers whose modules are featured in the Modular Marketplace. The American Tobacco Campus (ATC) is the heart of the FREE community programming including the Modular Marketplace, Pop-up Moog Factory and several art installations including the Aloft Musical Playground with Critter & Guitari (on the lawn at Diamond View Park), Pollinator Synthesizer with Burt’s Bees and Ranjit Bhatangar, and Moog’s collaboration with Yuri Suzuki called the Global Synthesizer Project. Tickets for Moogfest 2016 are available for $249 (Festival Pass) and $499 (VIP Pass) at www.moogfest.com. General Admission for the duration of the event, May 19-22. Access to all festival venues for performances and conference programming: conversations, workshops, and installations. VIP access for the duration of the event, May 19-22. *Priority access to all festival venues for performances and conference programming: conversations, workshops, and installations. Access to exclusive VIP viewing areas and VIP/artist events. Gift bag. Complimentary food and drink in select locations. Special merch deals. More perks to be announced. A limited number of Single Day Passes will be on sale Friday, April 15 starting at 12pm EST: $129 Thursday, Friday & Saturday, $69 Sunday. Engineer VIP $1,000 SOLD OUT! All prices exclusive of applicable fees. *Complete alphabetized list of talent below. A growing list of participants include: Aaron Soloway, Actress, Adam Florin, ADULT., Afrikan Sciences, Alessandro Cortini, Alexander Randon, Amos Gaynes, Andrew Benson, Andrew Kilpatrick, Angus Taylor, Anna Friz, Antenes, Arthur Russell’s Instrumentals, AUDINT, Basma Alsharif, Ben Frost, Ben Knapp, Ben Russell, Bicep (Live), The Black Madonna, Blazer Soundsystem, Blood Orange, Bob Moses, The Body, Bootsy Collins, Burton Rast, CFCF, Christian Rich, Chuck Lightning, Claire Evans, Cyril Lance, Cullen Miller, Daniel Bachman, Daniel Lanois, Daniel Lock, Darwin (DJ set), Dave Rife & Gabe Liberti, Dave Tompkins, David Friend, David Katz, David Van Koevering, Dawn of Midi, DAWN, Daye Jack, Demo Taped, Denzel Curry, Derek Ham, Disasterpeace, DJ Craig Layabout, DJ Harvey, DJ Lance Rock & Yo Gabba Gabba, DJ Nanny Cantaloupe, Dorit Chrysler, Dr. Blankenstein, Earthly (Live), Eban Crawford and Christina Cucurullo, Ed Bear, EMA, Emma Coats, Empress Of, Explosions in the Sky, Eyes Low, The Forge, Floating Point Collective, Floating Points (Live), Gary Numan, Gil Weinberg & Shimon, Germick Brothers, Ghostdad, Greg Fox, Grimes, Grouper, Gwenno, GZA, Hanz, HEALTH, Heathered Pearls, Helen Armstrong, Hieroglyphic Being, Hundred Waters, I Speak Machine, Ivica Ico Bukvic, Jaakko Eino Kalevi, Jana Hunter, Jaron Lanier, Jeff Kolar, Jlin, Joe Patitucci, Joel Ford, John Keston, Jon Shapiro, Jonathan Dinu, Julia Holter, Julia Kaganskiy, Julianna Barwick, Justin Grotelueschen, Kaitlin Prest, Karen Gwyer, Kate Stone, King Mez, Kode9 x Lawrence Lek, Kristen Gallerneaux, Kyle Hall (DJ set), Kyle McDonald, Larry Gus, Laurel Halo, Laurent “Tippy” Alfred, Laurie Anderson, Lister Hewan-Lowe, Luisa Pereira, Lunice, M. Geddes Gengras, Mac McCaughan, Mad Professor, Made of Oak, Manuel Clément, Marc Fleury, Mark Anthony Neal, Mark Mothersbaugh, Martin Brooke, Dr. Martine Rothblatt, Matt Werth, Matthew Ganucheau, Maya Weinstein, Michael Garfield, Miike Snow, Mike Butera, Modular on the Spot, Moon Ribas, Morton Subotnik, Moses Sumney, Mykki Blanco, Neil Harbisson, Nick Yulman, No Effects with Jesse Cohen, ODESZA, Olivia Block, Oneohtrix Point Never, Onyx Ashanti, The Orb, Party Illegal DJs, Patricia, Patrick Buchanan, Patrick McDermott, Pau Riba, Paula Temple, Peter Hyer, Pierce Freelon, Professor Toon, Qrion, Quintron and Miss Pussycat, Rabit, The Range, Ranjit Bhatnagar, RBTS Win, Rea McNamara, Reggie Watts, Rich Lee, Richard Smith, Rival Consoles, Robert Hood, Robert Rich, Ryan Germick, Ryan Hemsworth, Sam Aaron, Sam Conran, Sarah Davachi, Scott McCloud, Shallou, Shani Aviram, Sharon Mashihi, Sheba Love, Silver Apples, Skepta, Son Lux, Song Exploder with Hrishikesh Hirway, Stephi Duckula, Steven A. Cummer, Steve Dunnington, sunn O))), Susan Kare, Suzanne Ciani, Tatsuya Takahashi, tAz Arnold, Tim Hecker, Tlacael Esparza, Toby Heys, Tobias Overath, Phd, Tod Machover, Tory Lanez, Thomas F. DeFrantz, Trandle, Tyondai Braxton, Uli Sigg, Ultrabillions (DJ set), UV boi, Van Partible, Veronica Vasicka, Via App, Well$, YACHT, Yuri Suzuki, Zombi. Check out Hype Machine's curated Moogfest Playlist here featuring more than 80 Moogfest performing artists including YACHT, DJ Harvey, Tory Lanez, Moses Sumney and more. Tune in to the Moogfest 2016 Preview Channel on RBMA Radio running Tuesday April 12th through April 26th featuring archives from Laurie Anderson, The Orb, Floating Points and much more! For access access to the invite-only Beta phase - click on the link here and sign up. Moogfest is partnering with Urban Outfitters on a several upcoming projects. Listen to the Urban Outfitters | Moogfest 2016 Playlists on Soundcloud here and on Spotify here. 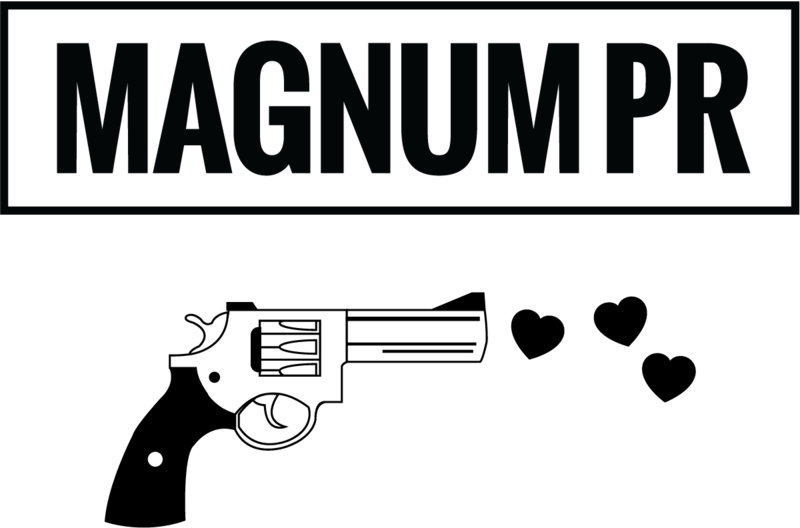 Copyright © 2016 Magnum PR INC, All rights reserved.